CALHOUN, Ga. - E.L. Mercer didn't want his grandsons climbing all over his fancy Beechcraft Bonanza airplane. So he did what he saw as the logical thing: He built them a museum and brought in a dozen planes they were allowed to climb on. 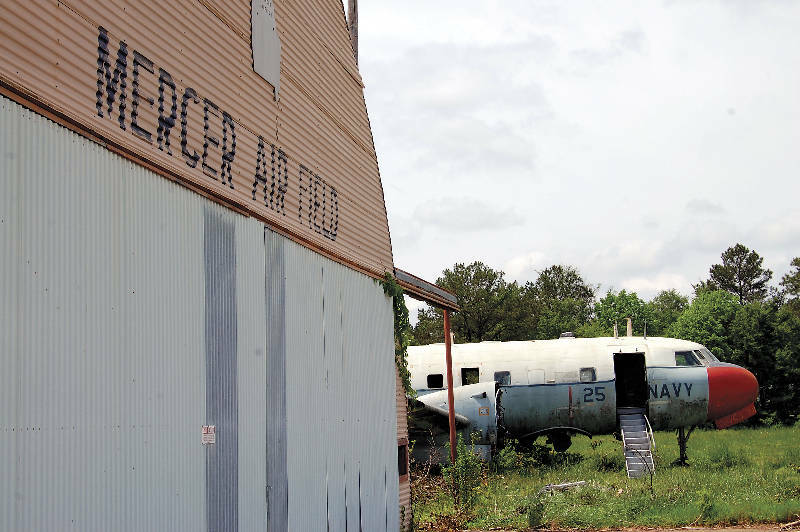 Mercer's World Aircraft Museum off Interstate 75 in Gordon County had nearly 20 aircraft and drew squadrons of enthusiasts during the 1970s and 1980s. But when Mercer's health deteriorated, the site fell into a tailspin that has led to an emotional wreck for his family. One year after his death, his last two planes are falling to pieces. His hangar is ready to cave in. His old runway is covered with knee-high weeds. The battered hulk of one plane is visible off the interstate while another is poised for takeoff, but aimed into a recently added billboard. "It grieves me so, I can't even drive down there," said Ron Anderson, Mercer's grandson. "I don't want to see." Mercer died last May at 81 years old. He left all of his property, including the grass airstrip, to his second wife, Edith Mercer. His daughter, Bonnie, contested the will, which blocks everyone from the property until a judge issues a ruling. But a court order hasn't stopped weeds, rain, sun and vandals from taking their toll on the planes and land. "It was some of the best memories," said Bonnie Anderson, remembering times with her father. "The worst memories are what's happening now. It's breaking my heart." Family members say the decline started in the late 1990s when Edna, Mercer's wife of 50 years, got cancer. Not long after she died in 2000, Mercer had two strokes that severely limited his ability to keep up the museum. "As he got older he just didn't have any interest in it any more," said Edith Mercer, who ran what remained of the museum in Mercer's final years. As the maintenance schedule grew more lax, museums and organizations that had loaned Mercer their planes began taking them back. The T-33A trainer went to an American Legion post in Alpharetta. The old F-86L fighter is now on loan to the Georgia Air National Guard. The menacing MGM-13A MACE missile was taken to Maryland. The only fighter left, an F-84F, will eventually be taken to the Marietta Museum of History in Cobb County, Ga., according to the National Museum of the U.S. Air Force. Aviation enthusiasts like Dave Gorman, of Knoxville, are saddened at the museum's demise. "You just feel helpless," said Gorman, who used to visit whenever he drove through that part of I-75. David Robinson, a war plane buff from Augusta Ga., remembers visiting Mercer's museum in the 1970s. The museum had his favorite plane, a Vietnam-era Navy fighter called the F-8 Crusader, but he watched as it "disintegrated" over the decades. Scavengers contributed to the decay. "They were tearing it up faster than we could fight them," Bonnie Anderson said. While family members aren't sure what will happen next, part of the airstrip's future seems certain - state and county officials plan to buy part of it to use in a new interchange on Union Grove Road and I-75 that will give access to the county industrial park. Gordon County Commission Chairman Alvin Long said the state is buying the right of way and he expects bids to go out next year. Construction will take about 18 months. Long, who remembered visiting the museum decades ago, said the county had not been in contact with the family. Mercer and Anderson said they did not know the details on the potential sale of part of the land. Tax documents say the Mercers' property is nearly 46 acres and valued at $955,841. But until a judge rules on the will, both parties are at a stalemate. "I can't touch anything out there," said Mercer, who moved back to Kennesaw, Ga., after her husband passed away. "I'm just kind of waiting it out." Anderson said she has "no idea" what she would do with the site if a judge awarded some of it to her, but she didn't think it would be possible to get any of the planes back. Ron Anderson said he would love to see the museum to continue in some fashion. He thinks that's unlikely, but said it's probably what his grandfather would want. "It was a sad end to a good man," he said.